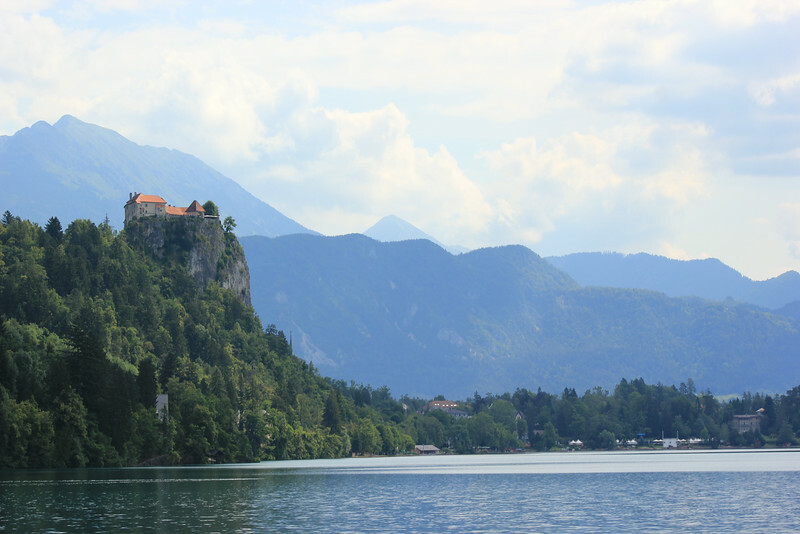 Lake Bled, Slovenia had been on my travel bucket list for many years. You’ve probably seen the photos; a church on an island in the middle of a turquoise lake, nestled under the Julian Alps. You could stay at a hotel in the small town of Bled, but I wanted to be close enough to walk down to the lake and see the sunrise burn away the morning mist. Early morning at Lake Bled, Slovenia. Camping Bled is located on the western edge of the lake. Our little green tent (bought on sale at InterSpar for 24 euros) sat in between a recreational vehicles that ranged from modest, older caravans that are probably only taken out for the weekend to luxurious motorhomes that had every amenity you could think of, including a satellite dish. Tent campers were fewer in number and many of them seemed to be on bicycle tours. The fellow next to us had a hammock next to his small tent and I envied his ability to carry everything he needed on his bicycle, not at all like us on this trip. When we open the car doors, half a dozen things fall out. I hadn’t been camping in over a decade and wasn’t sure what to expect. How things have changed! 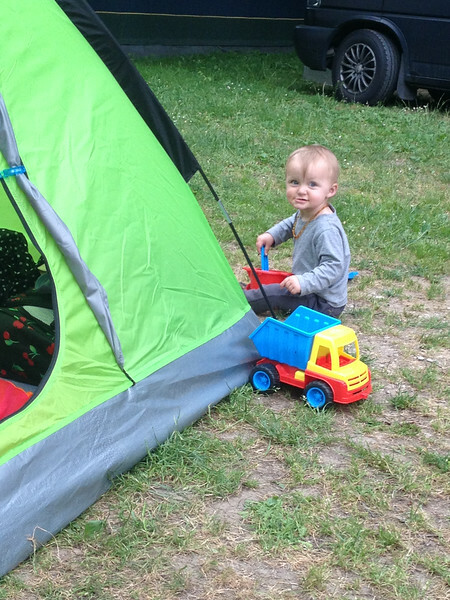 The entire campsite was covered by WIFI, which while not fast enough to stream video, was enough to be able to browse the internet and upload a few photos to Facebook. The campsite had a restaurant, small grocery shop, and a cafe/bar tent next to the swimming area. The tent had a large screen set up for watching the World Cup. The small grocery shop had fresh bread every morning and the popular breakfast option seemed to be to buy a few rolls and some sliced ham and cheese, or chocolate filled croissants. The restaurant next to the shop sold takeaway coffee so we took our breakfast down to one of the benches along the lake. 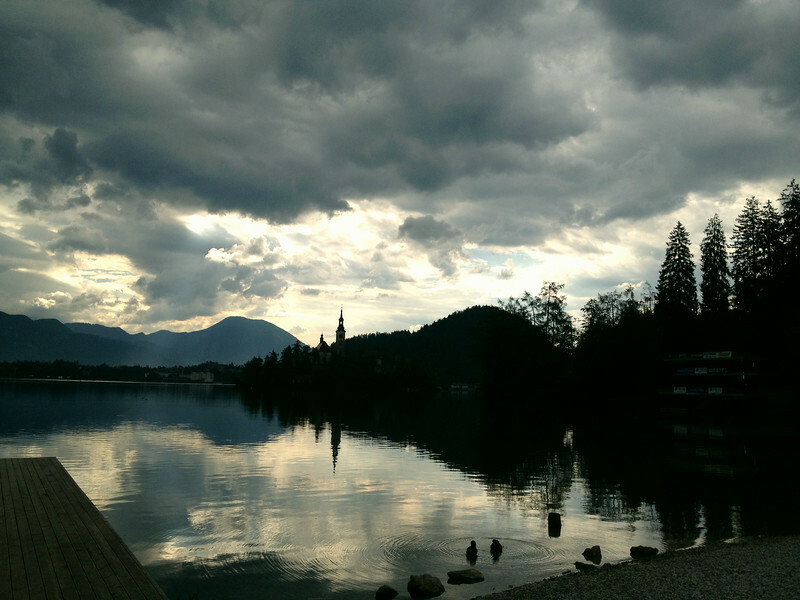 The waters of Lake Bled were once thought to have healing properties. While I can’t speak to that, the water is really as clean and crystal clear as you may have seen in photos but it was a bit chilly while we were there. Micheal went for a long swim, while Little Nomad and I had enough after 10 minutes. Peak season is in July and August and I expect that the water might be a little warmer then. If it is still too cold for you, Sava Hoteli Bled offers a thermal swimming pool for 6.50 euros a day. Assumption of Mary Pilgrimage Church on the island in Lake Bled, Slovenia. There are two ways to get to the island. You can take one of the gondola like pletna boats for 12 euro and you will be able to spend 30 minutes on the island. You can also rent a small swan rowboat for 10 euro an hour and then you can spend as much time on the island as you like. Bled castle overlooking Lake Bled, Slovenia. As usual, we skipped the castle. I’m sure the view from up there is stunning but I have seen enough castles in the past year. You can walk or drive up to the castle and entry is 9 euros. 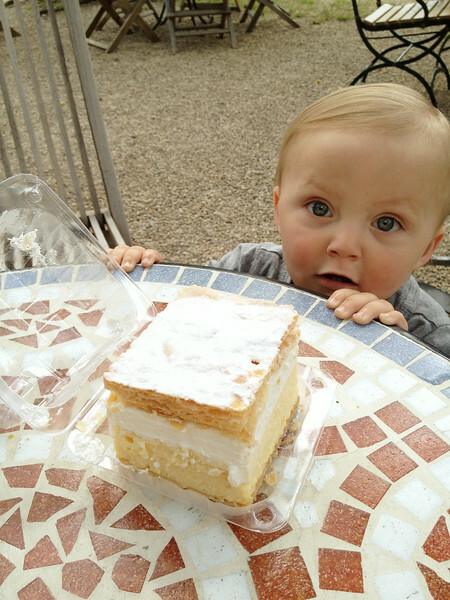 Little Nomad looks hopefully at a large slice of Bled cream cake. All over Bled you will see signs advertising Bled cream cake, or kremšnita. Over 10 million of these sweet cakes have been baked at Hotel Park since its introduction in 1953. We bought a slice for 3.50 euros at the campsite’s cafe and it was more than enough for two people to share. Nice one i was in Slovenia 2 years agao and reaaly enjoy that time. Very beutifull country and the people always they are really kind, Unfortunetally i didnt sighseeing the castle i didnt have enough time to do it :/.